For herself, she wanted sleet and ice, howling winds, thunder to shake the very stones of the Red Keep. She wanted a storm to match her rage. Winter descends on Westeros. The sun's strength weakens and the shadows grow longer with each passing day. The sunbaked plains of Dorne and fields of the Reach will soon feel the sting of the dismal days, but the twisting alleys and labyrinthine streets of the capital are no strangers to the darkness. The ghosts and spiders that thrive in King’s Landing know how to turn any situation to their advantage, and now the same power is at your command. 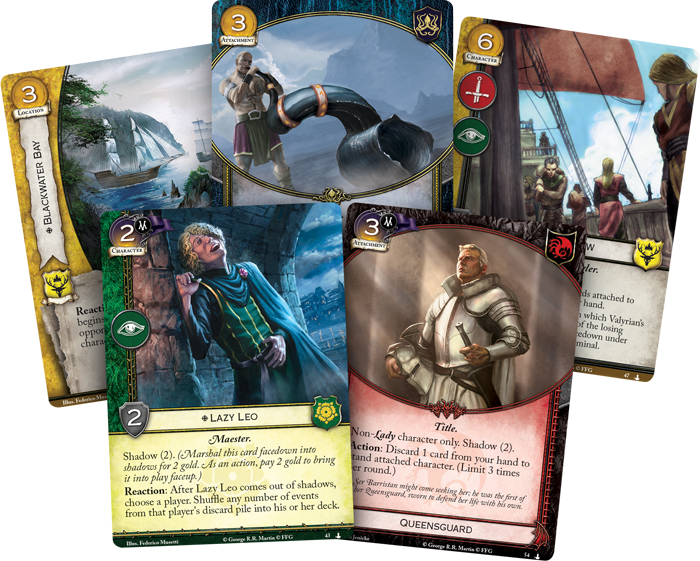 Streets of King’s Landing, the third Chapter Pack in the Dance of Shadows cycle for A Game of Thrones: The Card Game, is on sale now at your local retailer or online through our website! 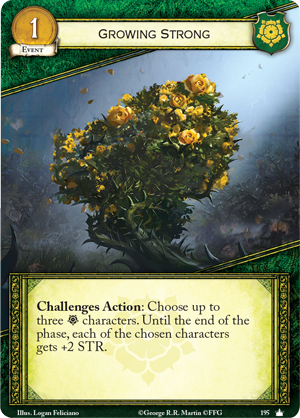 The Dance of Shadows cycle fully embraces the intrigues of George R.R. 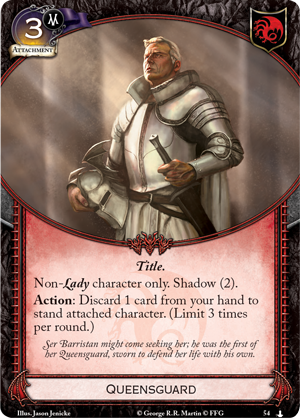 Martin’s A Song of Ice and Fire series with the return of the shadow mechanic from the first edition of A Game of Thrones: The Card Game. For the low cost of two gold, certain cards can be laid safely away in the shadows, protecting them from your enemy’s schemes and intrigue claims. In many cases, you now have an unprecedented ability to build complex strategies and play the long game regardless of which House you lead. 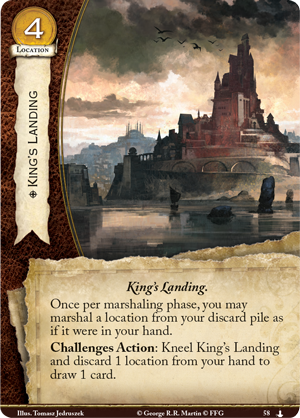 As the capital city, King's Landing (Streets of King’s Landing, 58) is a meeting place where diverse characters from across Westeros come together as those from far-spread villages seek shelter and security from the approaching winter. This forced proximity encourages those who reside there to learn from those around them and adapt to become stronger. 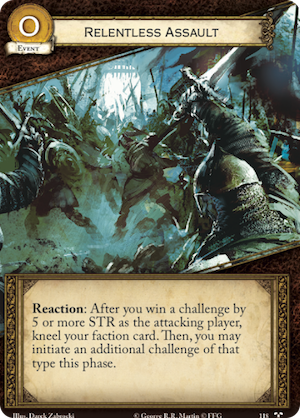 As such, in the Streets of King’s Landing Chapter Pack, each faction will find cards that borrow ideas from other Houses and tailor them to fit their own needs. For example, The Tyrells learn from the Martell’s ability to play the long game with their most idle student of the Citadel, Lazy Leo (Streets of King’s Landing, 43). 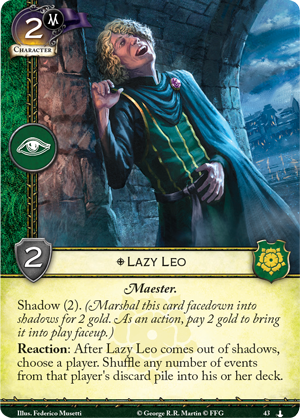 If you find this Maester early in the game, you may marshal him into shadows and hold him in reserve until his ability to shuffle discarded events into their owner’s deck is at its most effective. 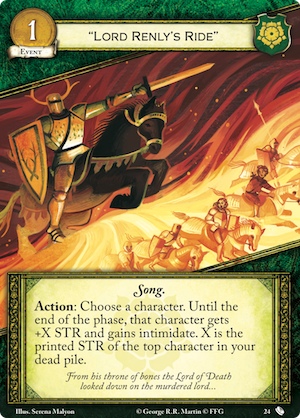 This can offer you multiple uses of events like "Lord Renly's Ride" (Guarding the Realm, 24) or Growing Strong (Core Set, 195), allowing you to manipulate the battlefield and ensure your characters have the STR needed to win the day. 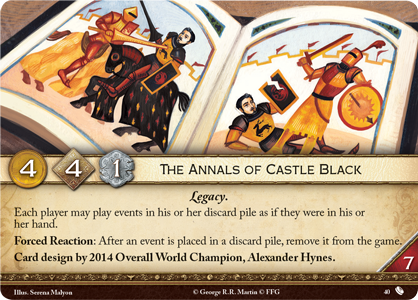 Otherwise, Leo can help you lay your opponent's plans to waste if they are hoping to harness The Annals of Castle Black (Guarding the Realm, 40). By keeping this student shrouded in shadows, you will be ready to counter at a moment's notice with the cunning of a snake hidden in the grass. While the Tyrells take lessons from their neighbors in Dorne, the Greyjoys may borrow something far more terrifying from House Targaryen. 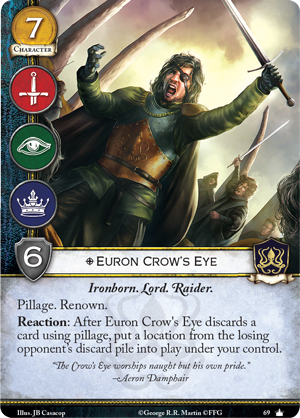 To sway the captains in his favor at the kingsmoot, Euron Crow's Eye (Core Set, 69) presents the ironborn with a relic of lost Valyria, Dragonbinder (Streets of King’s Landing, 52). This mysterious artifact has the potential to reshape history, both in the world of A Song of Ice and Fire and in your battles for A Game of Thrones: The Card Game. Sounding with the screams of a thousand souls, this Item provides its attached character with intimidate, and if you win dominance, you may kill that character gain a number of potent effects. 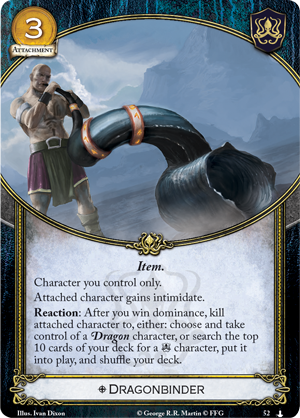 Firstly, you may search your top ten cards for your most powerful Greyjoy character and immediately put it into play. 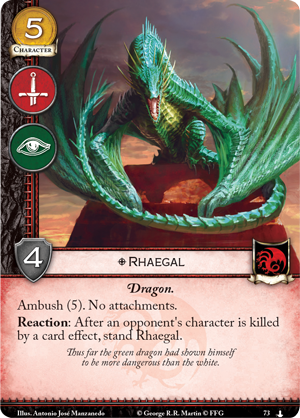 Or, if you are facing the Targaryens, you may use the artifact to take control of a Dragon character. Taking control of a Hatchling can minimize the possiblity of your opponent using Dracarys! 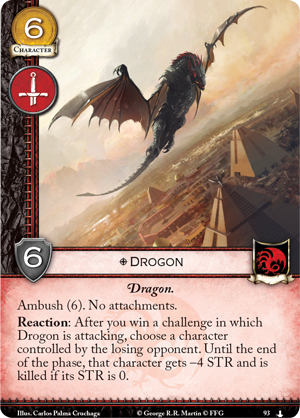 (Core Set, 176) against you, but the full power of Dragonbinder becomes nothing short of shocking when you consider that in the Dance of Shadows cycle, you have seen grown versions of both Rhaegal (Music of Dragons, 73) and Drogon (In Daznak’s Pit, 93). With the combined powers of Dragons and the Iron Fleet at their back, there is little that can stand between House Greyjoy and the Iron Throne. This is not to say that the Targaryens are now defenseless. Even if the Mother of Dragons loses one of her children, she may find renewed strength in those who pledge fealty to her. 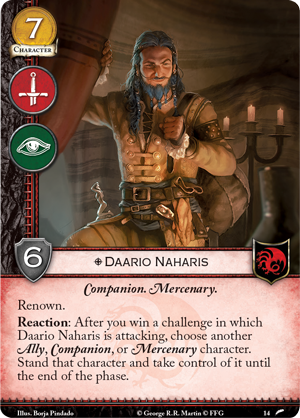 A member of Daenerys’s Queensguard (Streets of King’s Landing, 54) may stand and fight up to three times in a single round, provided you are willing to sacrifice enough cards from your hand. If you use this attachment on a key Targaryen character like Daario Naharis (The Archmaester's Key, 14), you can use them to dominate every challenge. 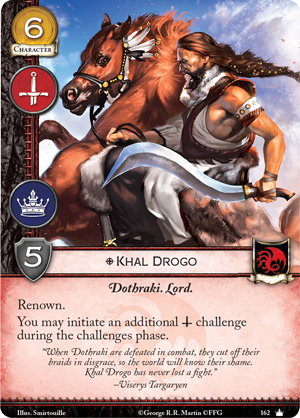 Otherwise, you can launch a Relentless Assault (Tyrion’s Chain, 118) with powerful leaders like Khal Drogo (Core Set, 162) to destroy your opponent’s board. In these times when wars have ravaged the land and resources are scarce, you must make the most of what you have, and if you cannot withstand your enemy's blows, the fate of your House may be at stake. Winter is upon Westeros. If you wish to claim the Iron Throne, you must act now. Do you have the cunning to live among ghosts? 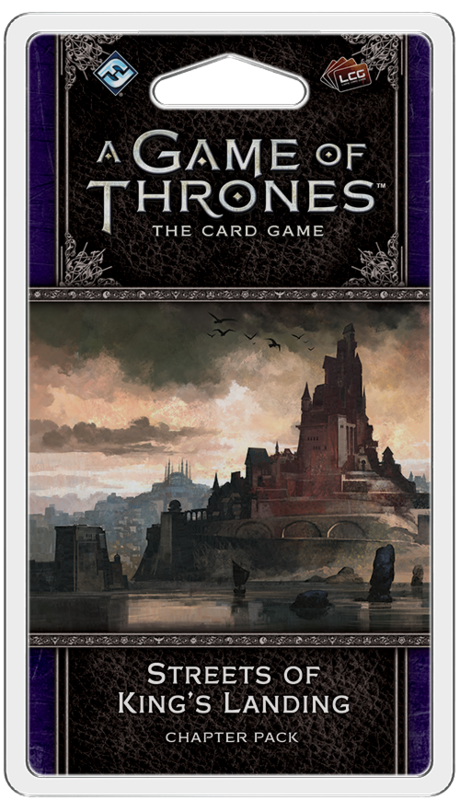 Take to the streets of the capital, allow the city to change you, and discover the secrets hidden in the shadows of the Red Keep! 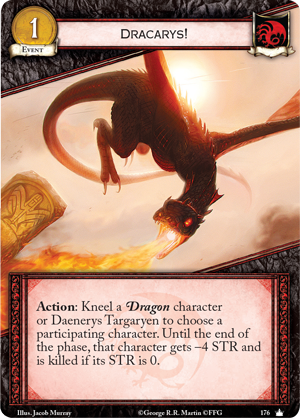 Pick up your copy of Streets of King’s Landing (GT33) at your local retailer today or on the Fantasy Flight Games website here!